West Bromwich Albion moved up to second place in the Championship with victory at bottom club Ipswich Town. 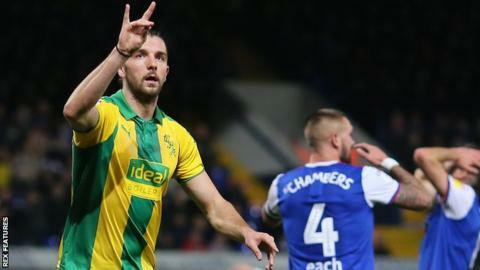 Jay Rodriguez scored Albion's first-half opener, netting his ninth goal of the season from six yards after Kieran Gibbs had nodded a right-wing cross back across goal. Rodriguez and Ahmed Hegazi wasted good opportunities before Harvey Barnes, who had earlier struck the post from 10 yards, fired low into the corner from a similar range to double Albion's lead. Ipswich substitute Kayden Jackson pounced on Tosin Adarabioyo's error to cause a nervy finale and youngster Jack Lankester clipped the post with a stoppage-time free-kick, but Albion held on to move within two points of leaders Norwich. Meanwhile, Paul Lambert's first defeat in three games as Ipswich boss leaves the Suffolk side still without a home win this season and five points adrift at the foot of the second tier. Albion beat fellow promotion challengers Leeds 4-1 just before the international break and, although they could not replicate the clinical finishing of that impressive victory, two well-worked goals at Portman Road were enough to secure their ninth league win of the campaign. Middlesbrough, Leeds and Sheffield United could all overtake the Baggies again if they win their respective matches on Saturday. Ipswich manager Paul Lambert told BBC Radio Suffolk: "I thought in the first half we were a little bit tentative. "You look at their bench - they've got guys that have actually won the Premier League coming on and we've got young academy kids making a name for themselves. "I said to the lads sometimes people say the table doesn't lie, well it does lie at times." West Brom head coach Darren Moore told BBC WM: "I thought it was an excellent away-day performance. "I thought we dominated the game once it settled down after 10 or 15 minutes and we created chances - we scored two goals, I think we could've got more. "I said to the boys that Paul Lambert's got this team (Ipswich) in the ascendancy - they won't be where they are for much longer because they work hard, they press and they're an honest team." Match ends, Ipswich Town 1, West Bromwich Albion 2. Second Half ends, Ipswich Town 1, West Bromwich Albion 2. Jack Lankester (Ipswich Town) hits the left post with a left footed shot from outside the box from a direct free kick. Kieran Gibbs (West Bromwich Albion) is shown the yellow card. Corner, Ipswich Town. Conceded by Craig Dawson. Corner, West Bromwich Albion. Conceded by Matthew Pennington. Corner, Ipswich Town. Conceded by Kieran Gibbs. Substitution, West Bromwich Albion. Gareth Barry replaces James Morrison. Foul by Jack Lankester (Ipswich Town). Goal! Ipswich Town 1, West Bromwich Albion 2. Kayden Jackson (Ipswich Town) right footed shot from the centre of the box to the bottom right corner. Matt Phillips (West Bromwich Albion) is shown the yellow card. Matt Phillips (West Bromwich Albion) wins a free kick on the right wing. Attempt missed. Kayden Jackson (Ipswich Town) right footed shot from the left side of the box is close, but misses to the left. Assisted by Trevoh Chalobah. Offside, Ipswich Town. Jonas Knudsen tries a through ball, but Kayden Jackson is caught offside. Goal! Ipswich Town 0, West Bromwich Albion 2. Harvey Barnes (West Bromwich Albion) left footed shot from the right side of the box to the bottom right corner. Assisted by Matt Phillips following a fast break. Attempt blocked. Teddy Bishop (Ipswich Town) right footed shot from outside the box is blocked. Assisted by Jordan Roberts. Attempt missed. Tosin Adarabioyo (West Bromwich Albion) header from the right side of the six yard box is too high. Assisted by Matt Phillips with a cross following a corner. Corner, West Bromwich Albion. Conceded by Cole Skuse. Attempt blocked. Jay Rodriguez (West Bromwich Albion) right footed shot from the centre of the box is blocked. Assisted by Hal Robson-Kanu with a through ball. Attempt missed. Gwion Edwards (Ipswich Town) header from the centre of the box is too high. Assisted by Jordan Roberts with a cross. Attempt saved. Hal Robson-Kanu (West Bromwich Albion) left footed shot from the centre of the box is saved in the centre of the goal. Assisted by Jay Rodriguez. Bartosz Bialkowski (Ipswich Town) wins a free kick in the defensive half. Corner, West Bromwich Albion. Conceded by Bartosz Bialkowski. Attempt missed. Jay Rodriguez (West Bromwich Albion) right footed shot from outside the box is high and wide to the right. Assisted by James Morrison. Substitution, Ipswich Town. Teddy Bishop replaces Flynn Downes. Jordan Roberts (Ipswich Town) wins a free kick in the attacking half.